Not so well known or as crowded and the Costa del Sol to the west, the Costa Tropical, sometimes also known as the Costa de Granada, has aproximately 30Km of attractive coastline with small beaches, rugged rocks and gets its name from the mild climate. This climate is tempered by the effects of the Sierra Nevada to the north, avoiding highest temperatures of the summer and supplying water for the lush vegetation. The largest town on the coast is Motril while nearby to the west lie Salobreña, Almuñeca and La Herradura, which form the main turist area of this coastline and to the east you will find the old fishing villages of La Rabita and La Mamola, along with Castell de Ferro. Inland are the Alpujarras well known as walking area, Sierra Nevada where it is possible to ski from December to May, and the fascinating city of Granada with it's Moorish history, including the famous Alhambra (well worth a visit for the architecture of the buildings and the gardens, though you may need to book in advance). 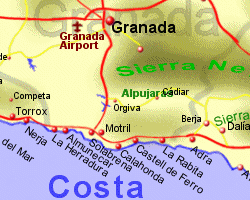 The Costa tropical is serviced by Granada and Malaga airport, approximately 1.5hrs to the west. Beautiful sea and mountain views, 10 minutes from beach, large private heated swimming pool, 3 garden areas, en-suite bathrooms, balcony. This luxury, five bedroom villa is situated in a beautiful, quiet complex of detached properties. It offers magnificent and quite exceptional sea views over the bay of La Herradura with a backdrop of the mountains beyond.Stunning sun-sets and spectacular views across the bay are just part of the charm of this villa. Detached Cortijo (Villa) with Private Pool, Gardens and BBQ Terrace, With its Natural Setting, Tijo Rosa is ideal as a Retreat or for Families with Children..
Tijo Rosa is a detached 19th century cortijo, sympathetically renovated in 2004 to retain it's original charm. Set in it's own large garden offering a high degree of privacy with 360 degree views. The cortijo is located on a mountainside in a quiet rural area, yet only a 20 minute drive to the nearest beach and the large town of Motril. The Villa is located in La Herradura bay on the Punta de la Mona with exceptional views of the beach, village and mountains and good access to the N340 motorway.